As many of you know, I’m making an effort to lose weight. One of my biggest challenges has been portion control. I love eating yummy food, and I often eat too much of it. Freschetta has made portion control a bit easier. They now offer FRESCHETTA® By the Slice – a single pizza slice from a full-size Freschetta pizza pie to give you a great pizza experience without having to exercise your willpower. I tried the Six Cheese Medley, as it was the only kind I could find in my area! While I wasn’t thrilled with the amount of calories packed into one slice of pizza, I was very impressed with the taste of my Freschetta Pizza by the Slice Six Cheese Medley. It was delicious – just the right amount of cheese and sauce with a hint of garlic. And I was pleasantly surprised to find that the crust turned out crispy in the microwave. The price was about $2, which makes this a nice alternative to eating lunch out. You could easily store this in a freezer at work and microwave it in just a few minutes for a tasty mid-day treat. Follow Freschetta on Twitter and like Freschetta on Facebook and you’ll get access to even more savings, sweepstakes and special offers. 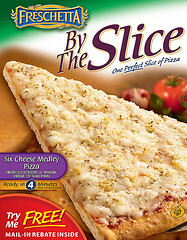 Freschetta would like to give one of you the chance to try Freschetta Pizza by the Slice for yourself. Enter to win a free Freschetta Pizza by the Slice and a 6-piece food storage set! This giveaway is open to all US residents ages 18 and older and will end at 9 p.m. CST on Thursday, April 28, 2011. Only one entry per person allowed. The information I collect in this giveaway will only be used to contact you if you are a winner and will never be shared or sold. I will randomly select a winner from all of the entries received. I will notify the winner by e-mail and announce it here at Northern Cheapskate. The winner will have 48 hours to respond or I’ll draw a new winner.